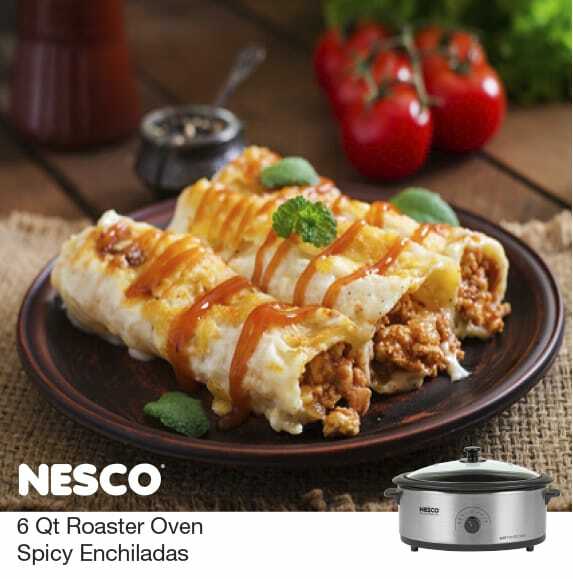 The NESCO® 6 Quart Roaster Oven is perfect for making Spicy Enchiladas. From frying the corn tortillas to baking the cheese covered enchiladas it’s simple, fun and tasty. Remove cookwell from Nesco® 6 Qt. Roaster Oven. Cover roaster base and preheat at 350ºF. Brown meat in fry pan; add onion and cook until onion is soft. Add enchilada sauce. Simmer about 10 minutes. Set aside. In fry pan, heat oil and fry tortillas in oil just long enough to soften. Dip in enchilada sauce. Put about 3 Tbsp filling in center, sprinkle with 2 tsp onion and overlap edges at center. Wipe cookwell with vegetable oil. Place filled enchiladas side by side into cookwell. Pour remaining sauce over enchiladas and sprinkle grated cheese over all. Remove cover and place cookwell into roaster. Cover and bake about 30 minutes or until hot throughout. Serve with sour cream.